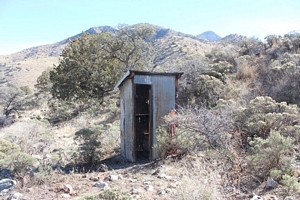 The Dos Cabezas mountains are located approximately 20 miles east of Willcox in Cochise County Arizona. 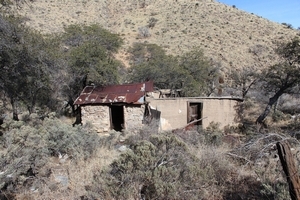 The area is perhaps best known for its past mining history. Today, access to the mountains is very difficult. Private property pretty much circles the range. 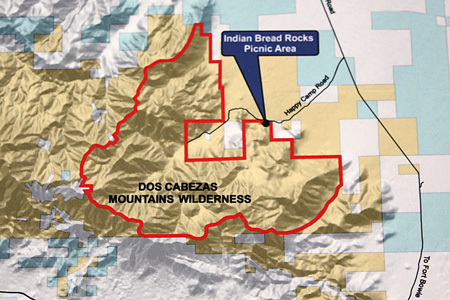 About the only gateway into the mountains is through the Dos Cabezas Wilderness on the east side. The Wilderness area is very primitive. 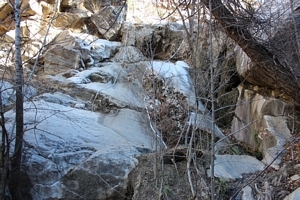 There are no constructed hiking trails, signage to direct traffic, or even parking areas. I have read that it receives very little usage, something on the order of 300 visitors per year. Travelers are pretty much on their own to figure out how to use the old abandoned roads, pack trails and game trails to navigate their way. 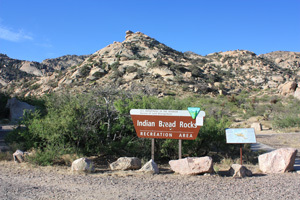 The eastside boundary is reached through a very rough extension of the Happy Camp Road beyond the BLM Indian Bread Rocks Picnic Area south of Bowie. 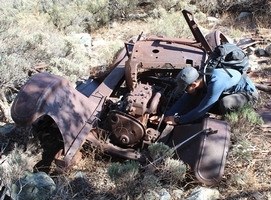 In 2011, I used the Wilderness to access a couple of mine sites further into the interior of the mountains. 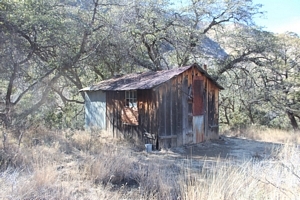 Since that trip, I had heard about a couple of old cabins in the area. We finally had the chance to go look for them. 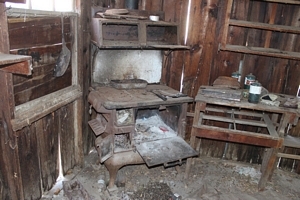 The first cabin that we walked into appeared to be quite old. At one time, it had been two rooms. One section was constructed of stacked stones chinked with a mud mortar. The second room had been adobe. The adobe partition has seriously deteriorated. Its roof has collapsed into the living space. 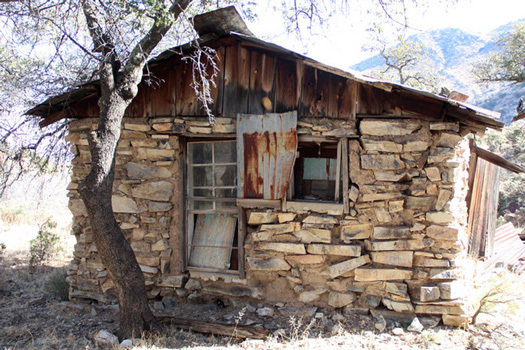 The stone part of the building seems more inhabitable, but is cluttered with a variety of household materials. The yard around the old building was subdivided by several low rock walls. A wire fence looked like it might have been part of a small animal pen. 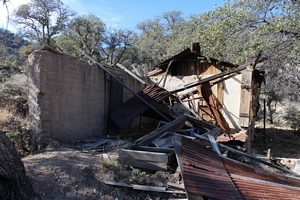 My thinking is that this was more than just a ranch line shack. 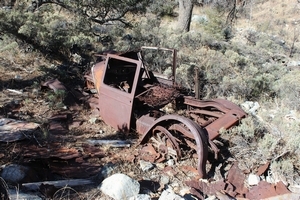 The outstanding feature at this old site was not the cabin, but the remnants of an old vehicle that was "parked" to one side. 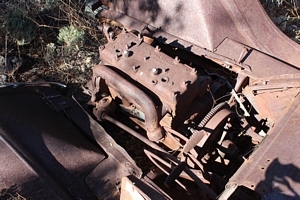 While there was a lot there, I did not recognize the engine or any of the other parts that I saw. 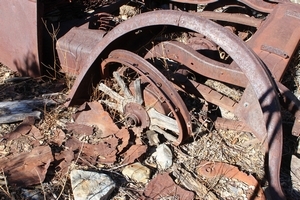 We guessed that from the wooden spoked wheel that the car may have dated back to the 1920s, but further identification would have to wait until we got back home. I have successfully identified other old vehicles in the past, but had no luck with this one on my own. 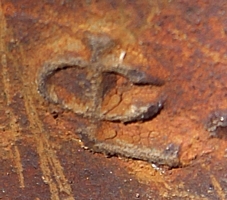 However, after posting several of the photos on www.exploreforums.com and www.smokestak.com the identification by other folks was quickly made. 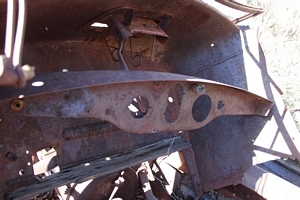 It was determined that the vehicle was more than likely a Durant Motors Company, Star brand of vehicle from the mid 1920's. It was probably their Coach model. 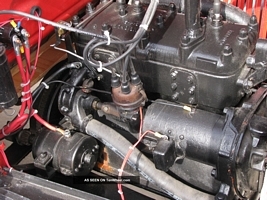 As can be seen in comparing the photos of the old engine to those of a complete and restored engine below, there is little doubt what the old engine was. This is the first one that I have seen that had a rear-mounted water pump. It also had an open flywheel. 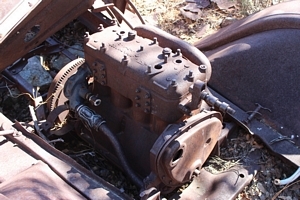 The transmission was missing from the old vehicle. There were few markings on the old car. The numbers below were on the lower part of the block. One of the online replies to my query noted that Star vehicles used Continental engines. 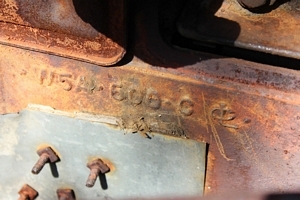 It was noted that Continental used a "W5letter-number" system to identify their engines. It is not clear what the "CL" mark represents. One thought was that it identified a foundry. 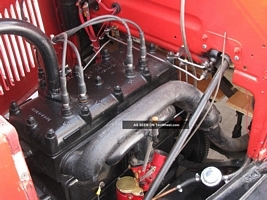 Another view was that it identified the "centerline" of the engine assembly. This would have been the point where a lifting strap would have been attached. A third thought was that the mark was for the Continental Motors Company. 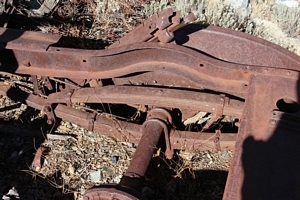 This vehicle at one time had a very heavy duty rear suspension. I wonder if it was stock? 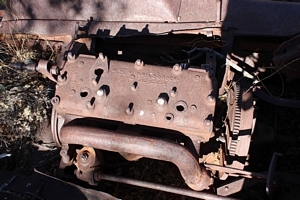 The rear brake mechanisms were still complete. 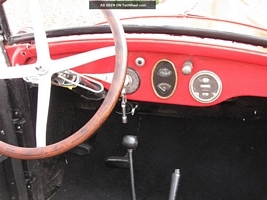 The photos below are from a posting here that shows a restored Star vehicle with a new looking engine. 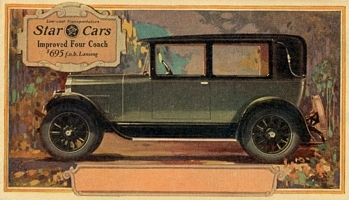 The engine is mounted in a sedan rather than the Coach. The pair of doors at the old site best match up with this model of the Star Company, the "Improved Four Coach". While at the cabin we were approached by a Border Patrol officer. He apparently had been out on foot patrol in the area and had come across our boot tracks. Wondering what we were up to, he had tracked us into the old cabin. 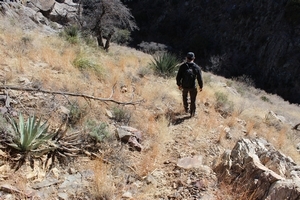 He told us that the old trails of the range were now being used by illegal immigrant traffic. 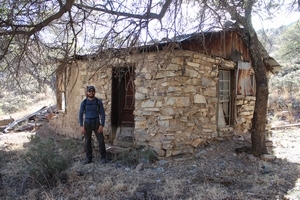 He had not been to this old cabin and did not know about the other one that we were headed for. 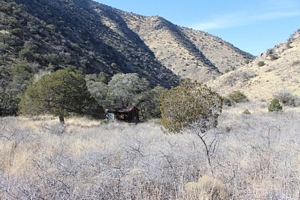 The route to the second cabin was once an old pack trail. That it was receiving use was evident. At one point, where the old trail diverted to avoid a series of pour-offs, rope rigging was in place so that a direct line of travel could be maintained. In January, the ice on the pools was quite thick. 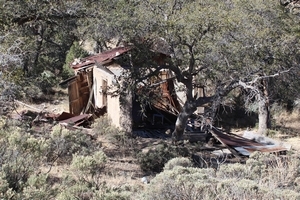 The second cabin was found under the canopy of several large oak trees. 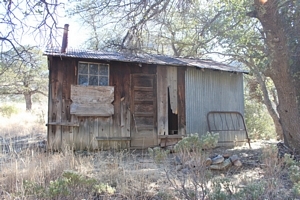 Its appearance and construction was like many old ranch "line " cabins that I have seen. 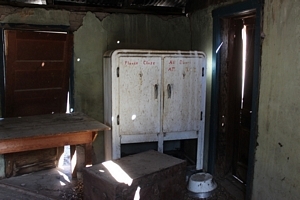 Inside, it was not in the best condition, but the roof was still solid and in a storm could be a refuge. 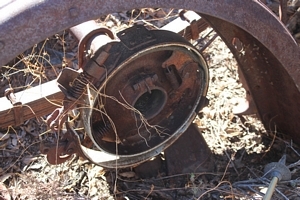 It was apparent that it had not been used for its intended purpose for quite a while. 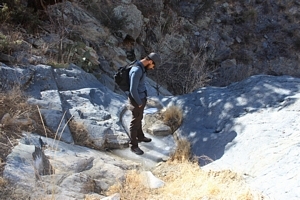 There is some effort required to navigate around the Dos Cabezas Mountains. 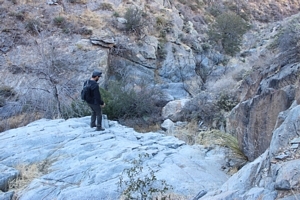 The "trails" are primitive and the terrain can be quite steep and rugged. This was the scene at the parking area when we started our hike into the Dos Cabezas Mountains. 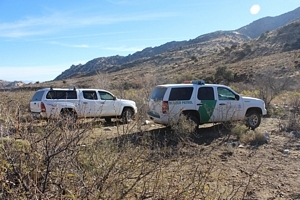 We met up with the Border Patrol officer who was on the look-out for illegal traffic. This is at least 60 miles from the border.